The Gustavus Adolphus College Dance Company is unapologetically pushing boundaries in this year’s spring showcase, “Falling Toward Beginning.” Several of the dancers have spent the last year embodying social justice through a dance and will present their work May 11-13 at Anderson Theatre. One of the main pieces of the repertory performance is “All Together Now” by award-winning choreographer Cynthia Gutierrez-Garner, who has worked with the students throughout the year on the dance. The theme at the center of the piece is non-violent resistance as it reflects back on the civil rights movement and marches that have occurred since then. Professor of Dance Michele Rusinko saw the work when it was premiered by professional dancers in 2016, and knew immediately that it needed to be performed at Gustavus. “Sometimes we don’t know why a visual image has such a strong empathetic response. You see pictures of student walkouts and an image grabs you by the heart. That’s what this piece feels like to me every time I rehearse it. Can I find language of why this speaks so powerfully? I don’t have language for that. But my heart responds each time,” she says. Gutierrez-Garner teaches at Western Oregon University, but thanks to the Johnson Fund has come to Gustavus several times this year to work with students. Combining social justice with art, she says she hopes to honor the structures that perpetuate change in society and build community. “When art becomes activism, a conversation is started. It breaks from conventions of entertainment or even simply personal expression,” she says. For students who have had a chance to work with Gutierrez-Garner, the experience has been electrifying. First year Megan Witte says that working with her has helped to truly understand the vision behind the work and has changed the way she sees the performance. “I think this piece has really started to become something bigger than itself. It’s more than a dance or a song, it’s a movement. To me, it has become a war cry of defiance, and I believe that it is relevant in the world today,” she says. In addition to “All Together Now,” several other pieces will be performed including a work by guest artist Jeffrey Peterson, whose jazz expertise has brought an important focus to this year’s dance curriculum. 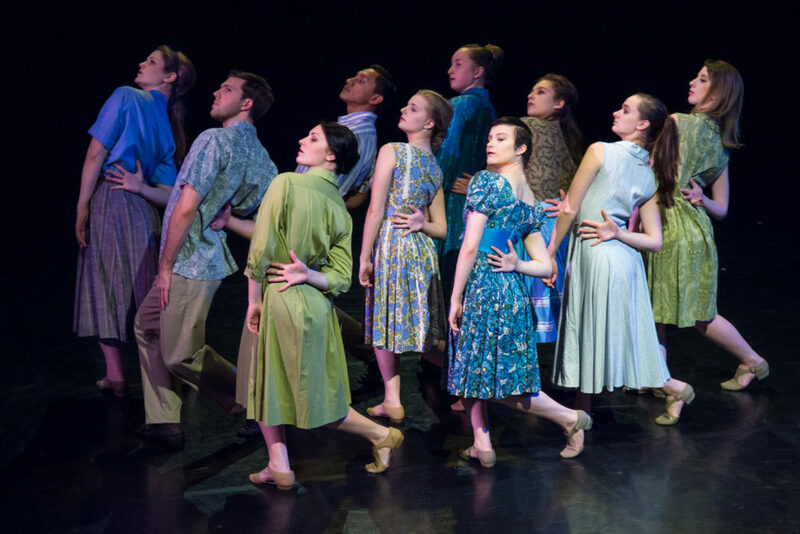 “Falling Toward Beginning: The Gustavus Dance Company in Concert” runs May 11 and 12 at 8 p.m. on May 13 at 2 p.m. in Anderson Theatre at Gustavus Adolphus College. Tickets are on sale now for the performance and can be purchased by calling 507-933-7590 or visiting gustavustickets.com.